John Riley reviews the new Canon EOS R, Canon's full-frame 30mp mirrorless camera, with new RF mount. 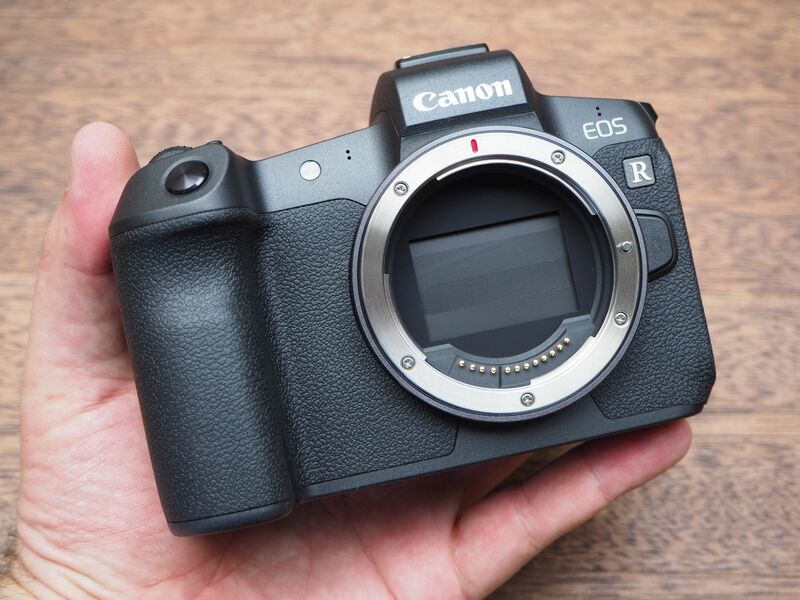 The Canon EOS R delivers a competent package, with great image quality, with a high quality 24-105mm f/4L lens, however there are a few design choices that will frustrate some, such as only one SD card slot, and heavily cropped 4K video recording. It seems that 2018 is rapidly becoming the year of the full frame mirrorless camera system. 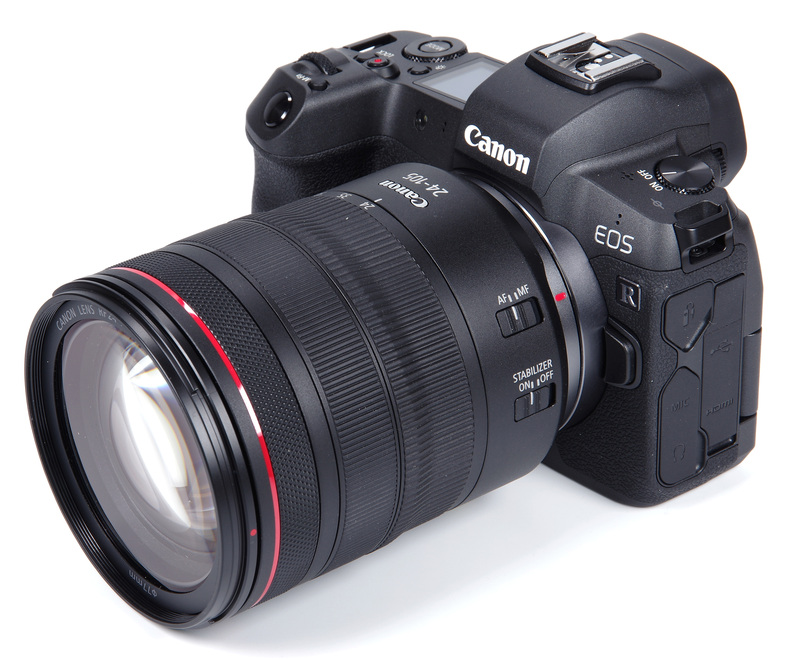 With other marques hot on their heels, Canon offer the new EOS R and its accompanying lenses, plus of course a handy adapter to enable the use of current EF and EF-S optics. 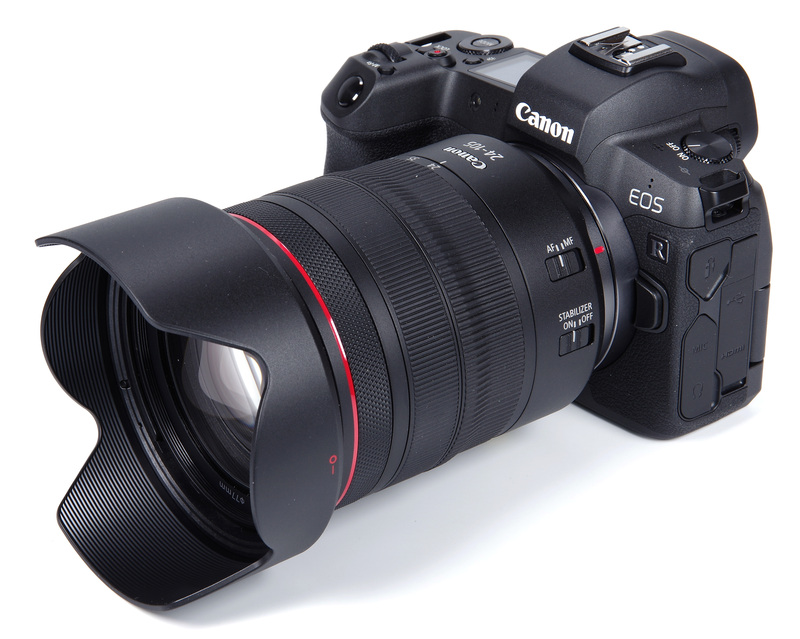 The Canon RF 24-105mm f/4L IS USM lens has been looked at in detail and now we examine the EOS R camera body, along with the Mount Adapter EF-EOSR. That both the body and lens are the start of a brand new system makes this an especially exciting prospect, so let's see how it works out in terms of both handling and the overall quality of the results. The main benefit of mirrorless CSCs is perhaps the removal of the mirror box, eliminating the vibration known as “mirror slap” and reducing the register distance of lenses. This latter point means that lenses can be less dependent on retrofocus design and in theory can be more compact, simpler in optical construction and theoretically providing better quality as a result. In practice there is little evidence that full-frame lenses have generally become smaller or lighter, but camera bodies have reduced slightly in bulk and indeed the EOS R weighs in at just 580g. 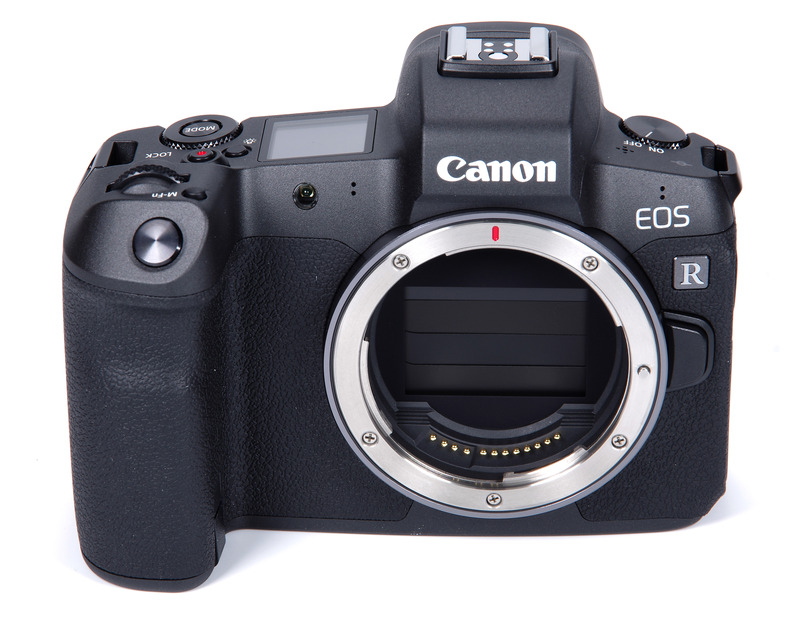 The core of the EOS R is a new, solidly made metal RF mount with electronic contacts. 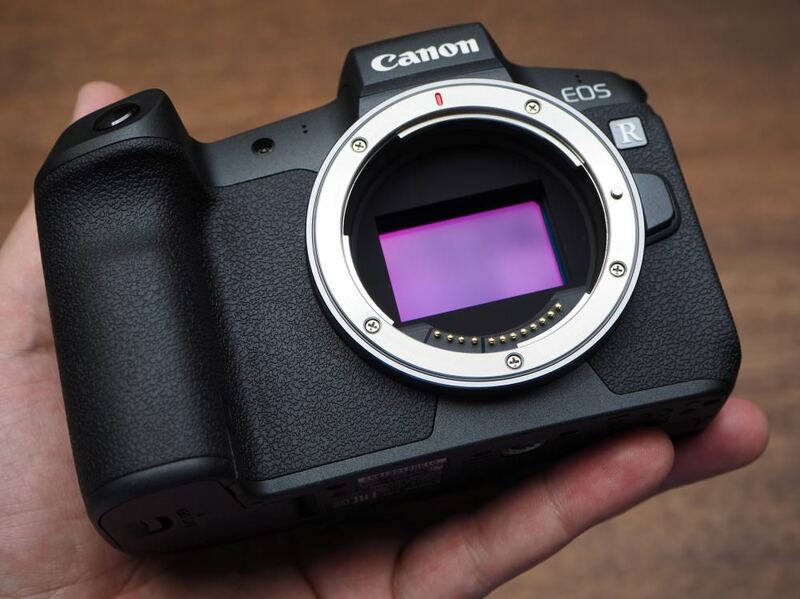 This has a wide throat, 54mm, the same as the Canon EOS DSLR range, that will make the design of wide aperture lenses much easier. Built into the concept from the start is an inexpensive, well designed mount adapter that gives the register distance for using existing DSLR EF lenses, plus all the necessary electronic contacts. 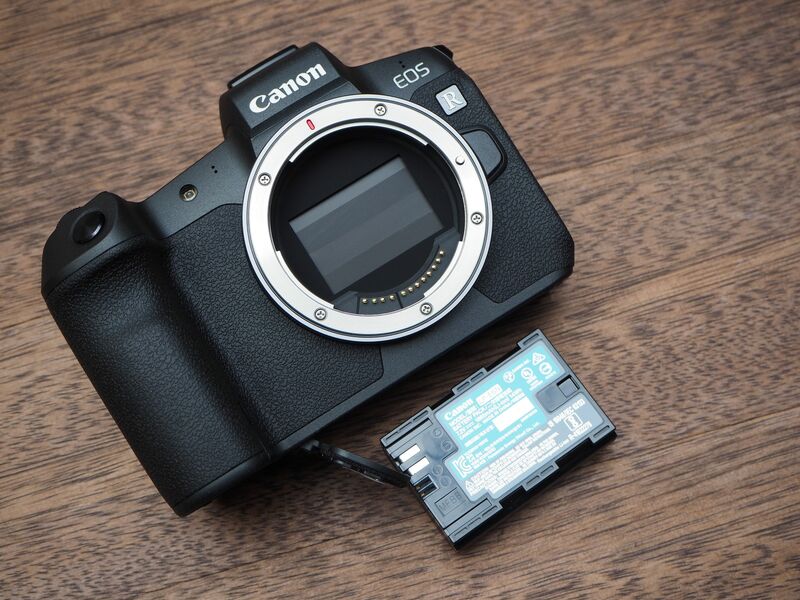 At least for now, the adapter is supplied with the camera on its own or as part of the kit of lens plus body. There is a 30.3mp full-frame CMOS sensor, plus DIGIC 8 Processing and in-camera Digital Lens Optimiser. Dual pixel CMOS phase detection AF is fast and reliable, with an impressive 5,455 focus points. The camera offers silent shooting thanks to an electronic shutter, and continuous shooting is available at speeds up to 8fps, or 5fps with continuous AF. The silent shooting is a clear advantage over the clatter of DSLR mirrors, and press events may become eerily silent if the mirrorless concept takes over. The AF is active down to a rather impressive -6EV. The camera features Dual Pixel Raw – which was first introduced on the Canon EOS 5D Mark IV (see the review for more details) – and this can be used to fine tune the focus after you’ve taken the shot on your computer. With the new RF lens mount, Canon has introduced four new lenses, including a standard RF 24-105mm f/4L IS USM lens, a 50mm f/1.2L USM lens, a 35mm f/1.8 IS Macro lens, and a rather large 28-70mm f/2L lens. The camera does not feature in-camera image stabilisation, instead relying on the lens featuring image stabilisation. Electronic image stabilisation is available for video recording, however, this crops into the image. The electronic viewfinder (EVF) in the EOS R offers a high resolution of 3.69million dots, and has a 0.76x magnification giving a large view. The rear screen is a 3.15inch touch-screen with a 2.1million dot resolution. 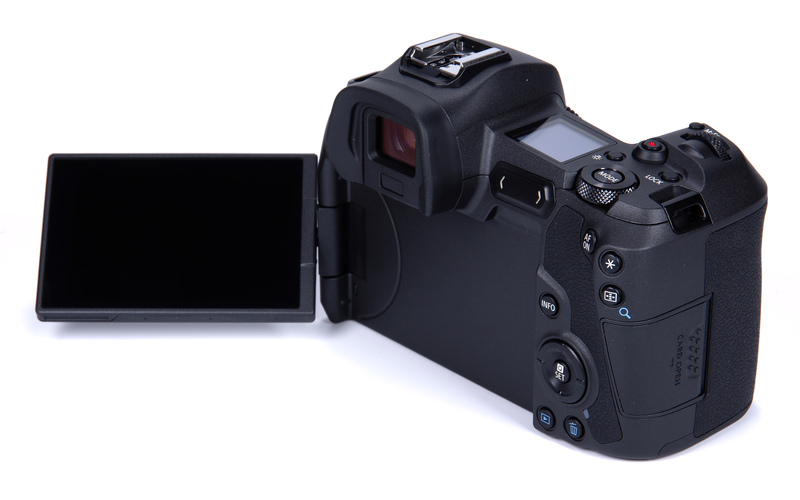 There's also a top LCD display giving shooting information, as well as battery life when the camera is off. 4K video recording offers frame rates up to 30fps, and there are built-in stereo mics. 4K video is UHD video resolution, for CINE resolution, you need to look at the Canon EOS 5D Mark IV. Video is recorded internally in 8-bit, and for 10-bit video recording you need to use the HDMI output. As you would expect, Wi-Fi and Bluetooth are built-in, which lets you remotely control the camera, and transfer images. Bluetooth offers lower power consumption compared to simply relying on Wi-Fi. The general feel of the EOS R is similar to a small but solidly made DSLR, and with lens it is fairly close in size, bulk and weight to a Pentax K-1 with its 28-105mm lens. The bulk just lies in different places. This means that although the mirrorless camera is in some ways more compact, we still need a bag to carry it in, it isn't pocketable, and it will burden us weight-wise to a similar degree. However, this isn't the whole point. The 24-105mm f/4 lens is fully covered in our review and it does blend very well with the camera body. Balance is perfect and the two feel very good indeed in the hand. Good solid manufacture inspires confidence. Different cameras have different strengths and the one real practical strength here is using the camera on a tripod. Being able to touch the screen and have the camera both focus on that point and release the shutter is fantastic. Being right handed unfortunately means that when our right hand moves in to touch the screen it passes the sensor that switches the view to the EVF and the screen goes dark. The answer is to use the left hand to operate the touch screen, maybe a minor point but also a minor irritation every time it is forgotten. There is also quite a dependence on the menu system to control commonly used parameters, rather than dedicated buttons. This is a question of familiarity though, and ultimately once we are used to the way it works it probably makes little difference. The options are all clear and the menu system works well. The silent shooting is amazing. No more clattering mirrors, something that will be very welcome in all sorts of shooting situations. The camera is also brimming with potential, as can be seen from the vast list of available features. There is virtually endless capability and any ergonomic inconveniences are as much a matter of familiarity as anything else. The rear monitor is excellent and the touch facility a great way to make all the menus work. Looking through the viewfinder, we see a slightly garish view of the world, but a detailed one that has no visible lag. This OLED EVF is actually pretty impressive and can be set to mimic the changes that are being dialled into the image by the photographer. It may still not have quite the same real-world clarity of the best glass pentaprism finders, but it is a different sort of beast with its own advantages, not least the absence of the bulk of the pentaprism housing. Operational temperatures down to 0C do not match the DSLR performance of -10C or so, perhaps because the viewfinders will black out at very low temperatures, but this will only affect quite specialised use. Apart from some specialised uses, this CSC can do more or less anything that a DSLR can do. Pressing the mode button and then the info button will switch between stills and movie shooting. In the movie mode there are auto, P, Tv, Sv, Manual and 3 custom modes. It's a shame there isn't a quicker way to switch between the still photo and video modes. - although you can simply press the video record button in photo mode, however this means you're not able to frame the scene before you start recording. The front lens ring can be customised, the rear "Multi Function Bar" (touch pad) can also be customised, as can a number of other controls on the camera. However, we didn't find the Multi Function Bar particularly intuitive or quick to use, with the front and rear control wheels being quicker and easier to use. 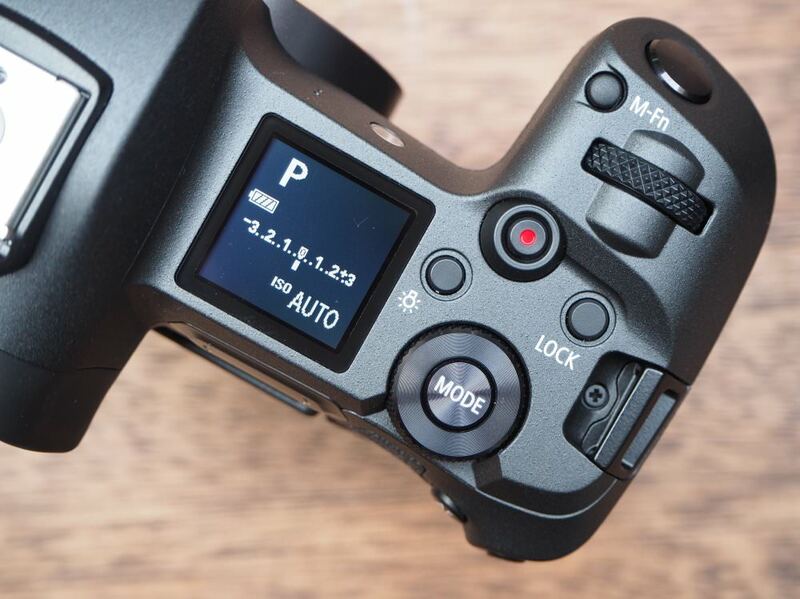 With so many customisable options it can take a while to get to grips with how the camera operates and it may take you some time to get the camera configured to how you would like it. There is side access to the memory card slot, which is a single SD card slot, which will disappoint some. The top LCD screen can be illuminated so that you can view it in low light. 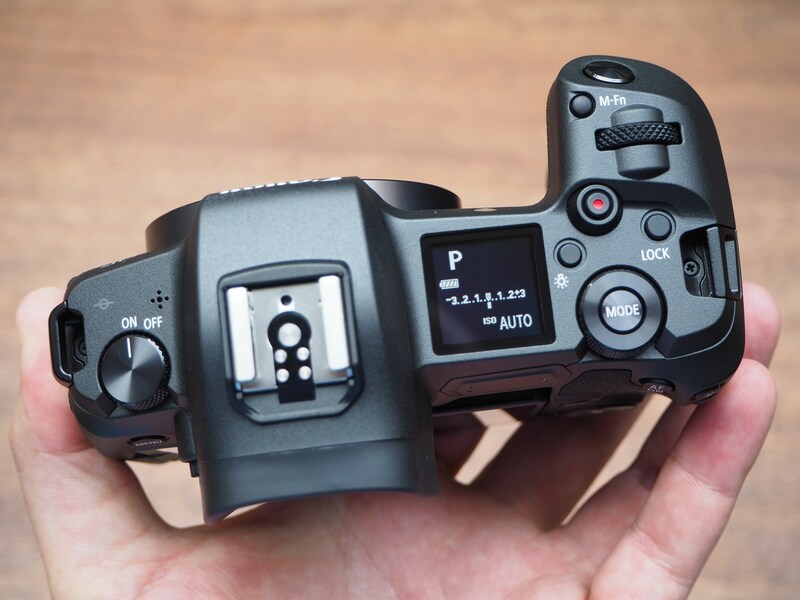 There are numerous AF controls, and you can use the touchscreen to set the focus position. You can use the 4-way controller to set the position after pressing the AF point button. You can customise how the AF system responds with five pages of AF options in the menu system. There are 5,655 AF points, which is a lot! However when selecting an AF point you can set the size to small or normal and there are around 65 points vertically (covering 100% top to bottom) and 88 horizontally (almost to the edges - covering 88%) when using the smaller size. Face and eye detection worked reasonably well but not in all circumstances, so often it was quicker to manually select the AF point using the touch screen and simply press the screen on the subject (for example on a person's eye). Battery life - Battery Life is rated at 370 shots, and can be extended further by enabling ECO mode. In battery info you can view the battery life left as a percentage (eg 71%) as well as the number of shots taken with that battery. OMG ! !....what a beaut ! !....nice size & weight, with great ergonomics & impressive IQ ! many, based on my state-pension !!!!. Gonna dream about this one tonight !!!!. Just to be sure......the weight is quoted as 580grms !.....yet in the specifications it's quoted as 660grms ?? I'm assuming the heavier weight is with the battery installed ? ?....not mentioned in the specs !!. Is there any indication when it will hit the retailers shelves ? ?......I've seen Jan 2019 mentioned, but that seems so far off ??. I just can't get this camera out of my mind ! !....I'm obsessed with it !!!. Out came the scales and I have just measured the weight, without card or battery, at 580g. With battery, card and body cap the weight is 660g. Quote:Out came the scales and I have just measured the weight, without card or battery, at 580g. With battery, card and body cap the weight is 660g. makes it confusing when reading the review & specifications !. I find it strange that for ages you have marked down other cameras for short battery lives and/or lack of dual card slots but somehow these are not failings which would cause less than 5* for features on this camera, especially given the other 'cons'. Not a knock on Canon, just reflecting how inconsistent your reviews are. The ratings are assessed on all the factors available and with comparison to competitive products in mind as well. Each star is of course a band, not a single mark, so a five star rating does not imply no imperfections or omissions, but rather that the product is in the top band. No system is perfect and the star grades are no exception, but they do provide a useful guide alongside the summary. I've been looking forward to the release of a mirrorless DSLR camera from Canon and I've had the chance to test it for a couple of hours at their Full Frame Roadshows. The noise levels are incredible, even at ISO 12800 and focus is extremely fast but for me, as an action shooter, it lacks the 2 most important features of a mirrorless camera - high shutter-speed and silent shooting which is only programable on single-shot. Unless Canon issue a software release that addresses these issues pretty swiftly my credit card is staying in my wallet. I've been looking forward to the release of a mirrorless DSLR camera from Canon and I've had the chance to test it for a couple of hours at their Full Frame Roadshows. The noise levels are incredible, even at ISO 12800 and focus is extremely fast but for me, as an action shooter, it lacks the 2 most important features of a mirrorless camera - high shutter-speed and silent shooting which is only programable on single-shot. Unless Canon issue a software release that addresses these issues pretty swiftly my credit card is staying in my wallet. Features: 5/5 with one SD card slot? Also, a heavily cropped 4k video. C'mon. 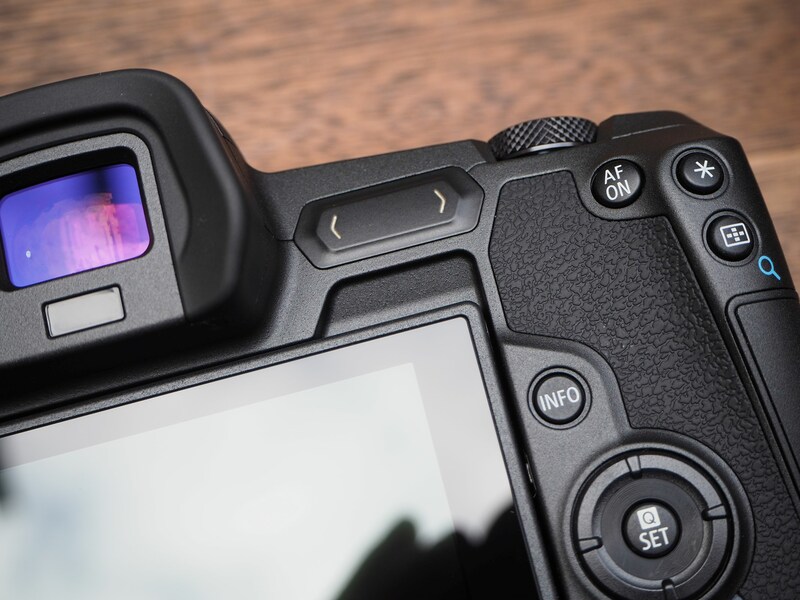 Nikon Z has also one memory card slot but it is an XQD card slot. XQD cards are made to totally different (higher) standards and they are not supposed to fail before the camera. Haven't heard any professional reporting a corrupted XQD card. Features: 5/5 with one SD card slot? Also, a heavily cropped 4k video. C'mon. Nikon Z has also one memory card slot but it is an XQD card slot. XQD cards are made to totally different (higher) standards and they are not supposed to fail before the camera. Haven't heard any professional reporting a corrupted XQD card. love this camera and not even used it yet, Mine is on order and cannot wait. I see many benefits for me as a landscape and wedding photographer, the ef lenses i have are amazing and will go well with this body, I understand that the ef lenses work flawlessly with the adapter rings also loving the filter ring, right up my street for filming and landscapes, loving the focus points of which there are over 5ks worth. loving the fully rotating screen, for me low angle shots will not be an issue anymore, loving the touch screen, loving the auto focusing in video, loving the size and ergonomics of this camera, loving the eye focusing and apparently there will be a firmware upgrade from Canon sorting a couple of issues I am sure. so not much not to love really, the 30 megapixels is plenty for me as well, I own the Canon 5Ds and 5D mkiii with many lovely L lenses so this camera will be in my bag and I can see me using it a lot if not all the time, with weddings still booked for this year I am really excited to have this camera in my hands. love this camera and not even used it yet, Mine is on order and cannot wait. I see many benefits for me as a landscape and wedding photographer, the ef lenses i have are amazing and will go well with this body, I understand that the ef lenses work flawlessly with the adapter rings also loving the filter ring, right up my street for filming and landscapes, loving the focus points of which there are over 5ks worth. loving the fully rotating screen, for me low angle shots will not be an issue anymore, loving the touch screen, loving the auto focusing in video, loving the size and ergonomics of this camera, loving the eye focusing and apparently there will be a firmware upgrade from Canon sorting a couple of issues I am sure. so not much not to love really, the 30 megapixels is plenty for me as well, I own the Canon 5Ds and 5D mkiii with many lovely L lenses so this camera will be in my bag and I can see me using it a lot if not all the time, with weddings still booked for this year I am really excited to have this camera in my hands. This looks to be a good camera but I was curious about your comment on the "garish view" via the EVF. How does this compare to a Fuji EVF (mine is on the XT-1 and is very clear providing an accurate look of the shot to be taken). I wonder if this is the case with the Canon? I found the view through the viewfinder to be a bit unrealistically contrasty and saturated, compared with the back screen. However, it's not a major thing and I am sure that it's perfectly usable. I wouldn't like to make a comparison without both cameras being side by side on an identical subject. It's very subjective anyway, with one person perhaps viewing an HDTV or 4K image as over sharp and a bit unrealistic and someone else being just blown away by the detail.